Receiving love, opening our arms to love - from our mother - is one of our earliest instincts. And yet most of us experience early on that reaching for love is not always reciprocated. Instinctively we begin to close our heart, and this often manifests itself physically by "armoring" ourselves with tension in the chest/shoulder/upper back area. The armor and/or the physical pain of the tension protects us from feeling hurt. In return we feel the pain of separation from others. We usually develop many compensation strategies in order to not to feel the pain anymore or to get the feeling of love and connectedness in another way. This includes addictions, isolation, distractions, etc. The impulse to open oneself again for love, however, remains always present under it - it belongs to our nature. Through Breathwork we can break through our limits, which we set in everyday life through our mind or our conditioned control and protection mechanisms, and reconnect with our original quality of deep love for ourselves and others. Before the breathwork session we do some dancing or shaking to loosen up the body, a meditation to connect to our heart as well as a powerful partner exercise to open up our heart armouring. It takes place at Mind In Meditation Studio, Weststrasse 62, in Zürich. If you have health problems or if you are pregnant, please contact me before the workshop (info@rebekkathommen.ch). 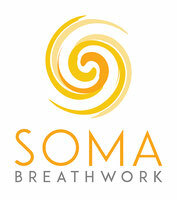 Please be aware that breathwork is not a psychotherapy and cannot replace one. In case of conscious, distinct (childhood) trauma, especially also shock trauma, or distinct symptoms like panic attacks or strong anxiety I advise against attending workshops and recommend 1:1 sessions. Bring comfortable clothes and a water bottle. I am looking forward to breathing with you soon! *With the transfer of the amount you are bindingly registered for the workshop. I do not offer refunds. However, you have the possibility to pass on your spot. For very short-term registrations (on the same day) I accept a cash payment, but the price will then be CHF 5 more. Die tiefe verbundene Atmung lockert unsere Kontrollmechanismen, aktiviert unser Nervensystem sowie Selbstregulierungs- bzw. Selbstheilungsmechanismen. Dadurch können wir ungeliebte Emotionen, Gedanken und Stress, die im Körper blockiert sind, wieder in den Fluss bringen. Kombiniert mit Körperübungen, mitreissender Musik sowie Elementen aus geführten Meditationen/Trancereisen öffnen wir uns der Transformation auf physischer, emotionaler und mentaler Ebene. Die Sessions finden im Mind In Meditationsstudio an der Weststrasse 62 in Zürich statt. Falls Du gesundheitliche Probleme hast oder schwanger bist, bitte ich Dich, vor der Sitzung mit mir diesbezüglich Kontakt aufzunehmen (info@rebekkathommen.ch). Bringe bequeme Kleidung Trainer-/Yogahosen und einen Pulli sowie eine Wasserflasche mit. *Mit der Überweisung des Betrages bist Du verbindlich zum Workshop angemeldet. Rückerstattungen bieten wir keine an. Du hast jedoch die Möglichkeit, Deinen Platz weiterzugeben.